This entry was posted on 25th May, 2015 . Last April 28th we received a visit at the mill by ladies that were traveling together for�Behind the Scenes Adventures Knitter�s Argentina and Uruguay., with the pleasant trip leader�Cynthia LeCount Samake. When they arrived Luciana gave them the grand tour of the mill, showing them each work station, explaining the whole process which each skein goes through after arriving to the mill. They got to see the drying rooms, in which the heating is powered by solar panels on the roof. These solar panels also provide energy to warm the water used in the dyeing process. Each lady dyed a skein of Malabrigo Yarn Sock and Mecha using the Box method, which is the one used to dye Selecci�n Privada. Their dyeing coach was Flavia. In preparation for this dyeing session, we had prepared dyes in some of our most popular colourways. Line up the wool! It is dyeing time! Choosing what colours to use, and thinking about what we want our end result to be is always so exciting! Creativity at its peak. Then, while they gave the yarn time to absorbe the dye, there was a coffee break with alfajorcitos de maizena, a really delicious Uruguayan treat. Look at the results! Gorgeous colours, ladies! After they checked out the results of their dying session it was time to hit the shelves and bags for some shopping! That's when the things got really hectic ;) Stay tuned for our next post about the visit to La Serena and getting to know our sheep! This entry was posted on 13th July, 2012 . This entry was posted on 26th October, 2011 . We stop by The Yarn Company to say hello to Tavy Ronen and Stephen West was teaching and showing his works. This entry was posted on 9th July, 2011 . Wewill be there!! Come visit us and say hello! This entry was posted on 14th June, 2011 . I just came home from TNNA and just wanted to pop onto the blog and say a quick thank-you to everyone who stopped by our booth. Whether you were a shop owner, a designer, or another yarn company just swinging by to tell us your appreciation for our yarns, it really was the highlight of each of the days to get to know people I have always only known online. I am so excited about the work we discussed, the orders we placed, and our future dealings with so many of you! TNNA was a pleasure and I will see you all again in Arizona. This entry was posted on 16th May, 2011 . Please be sure to stop by and see us at any of these upcoming events: Attending: Tobias, Antonio, possibly Hannah Come see us to explore the market and see a display piece in the fashion show! We'll have yarns and samples from the books on-site, but nothing for sale, though other vendors at the show will be carrying Malabrigo Yarns. Attending: Tobias, Antonio, Hannah Stop by and talk to us about submissions, upcoming projects and to add yourself to our newly-developing designer database. Don't forget your portfolio and business cards. Hannah will be on-site to discuss existing or potential projects with interested designers. This entry was posted on 11th May, 2011 . This year, we were lucky enough to be able to hold a trunk show at The Needle Nook in Atlanta, Georgia! We have been friends with Arlene from The Needle Nook for a long time -- we even named a silky colorway, 'Arlene's Purples', after the owner. 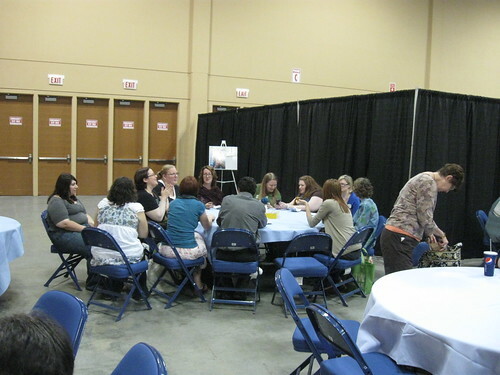 So not only was it a time to show off some of our samples and knits, but a great chance to spend time with some friends. Above, you can see Tobias next to the sign advertising this exciting event! So many knitters came to look through -- and model -- our wares! We loved seeing what people thought of colors they hadn't seen in person yet, handling the yarns in different variations. It's a rare chance when you can see the same colorway worked up in fancy Lace shawls and thick Rasta cowls! Of course, you can't have a trunk show without Tobias modeling something for you -- he really is so good at it! We keep telling him he should strut his stuff on the runway sometime! This entry was posted on 18th April, 2011 . After Handarbeit & Hobby, Marcos (Tobi's brother) and Paty went to Barcelona and they met the Teixicomanes ladies. 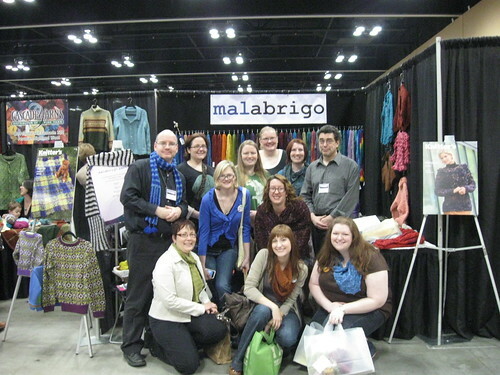 �They know all about malabrigo. Elles�saben�tot�sobre�Malabrigo, salutacions! A. This entry was posted on 27th September, 2010 . Antonio and Tobias at Needlemarket! This entry was posted on 8th September, 2010 . If you're going to the 2010 Northwest Needle Market this year, keep an eye out for Antonio and Tobias! Needlemarket is the "World's Premiere Wholesale-Only Market", and happens yearly just outside of Seattle, Washington. If you live in the area or you're a wholesaler stopping by (they say people come from over 200 different stores), don't forget to check out the new colors we have in several of the bases, or take a good look at Rios, our new superwash worsted base! There will be a fashion show and tons of opportunities to interact with vendors and other store owners. For details on location and attending, check out the website. The guys would love to see you and say hello, and I personally can't wait to hear all about what they've seen, and share some of it with you here on the blog. Sheep Week - Giveaway Winner! This entry was posted on 30th July, 2010 . Goodbye, Los Manantiales -- it was good to explore your grassy pastures, stone steps and walkways, and fruit trees! We had a wonderful time! And now, the two great rams will choose the giveaway winner! The winner will receive, by mail: 1 skein of Silky Merino in Celeste 1 skein of Silky Merino in Helechos 2 skeins of Silky Merino in Tatami 1 skein of Worsted Merino in Natural 2 skeins of Rios in Coco 1 skein of Gruesa in Natural (Gruesa is Corriedale! We felt we needed to represent the other sheep here in Uruguay a little, too!) Congratulations to Glockeroo for winning this great prize! Thank you for your sweet comments, everyone -- it has been a great Sheep Week! Glockeroo, we'll contact you for your mailing address. This entry was posted on 29th July, 2010 . This herd is the largest breeding herd of ewes (3,200) in all of Uruguay. Many farms may have a few more ewes, but these ewes are all breeding stock. A few of them even have lambs, and it was a real treat to see the gauchos round them up so we could see them in a group. Stay tuned. Tomorrow is the last day of Sheep Week and the winner (and prize) of the Sheep Week giveaway will be announced! This entry was posted on 27th July, 2010 . They tell you not to look a gift horse in the mouth, but does the same go for a Malabrigo sheep? No way! You can tell how old a sheep is by looking at how many teeth have grown in on the front of the bottom jaw. The sheep to the left is a very young sheep - only one year old. When lambs are born, they have a small set of milk teeth and an upper dental pad. Sheep are marked with a plastic earring that is put in very carefully - the sheep's ears are extremely delicate and the farmers are very concerned about risking pain or infection. Every sheep is pierced with great care. Some farmers even make sure that their sheep can be identified if their tag comes off by tattooing the inside of the ear with the same number.� All the numbers are often entered into a computerized data system with information on the micron count, age, and health of each sheep. Contrary to what you may think, sheep aren't only judged on micron or luminosity (the whiteness of the fleece), but also their general health and structure. If a sheep has a lopsided gait or his legs are too short, even with a perfect fleece, he will score lower in competitions than a sheep that has a good build. This entry was posted on 26th July, 2010 . The sheep we use for Malabrigo are only the finest merino sheep in Uruguay. This means that the farms have to meet our high standards too, especially in areas like animal treatment, cleanliness, and herd management. SUL, which monitors regulations of wool breeding and herd management, keeps very high quality standards as well. For instance, the Uruguayan wool farmers are not allowed to use mulesing methods to deal with flystrike -- instead, they are trying to breed out the excess folds, and keep their herds small enough to deal with infection and disease. The herd I visited is located in Paysandu, which is one of the Uruguyan states that contains the most wool farming. The ground there is rocky, which makes it perfect for sheep, who are best left to nibble at what grows up through the rocky ground. If they have too much food, the micron and fineness of the wool is compromised -- too little, and the sheep are unhealthy and produce brittle fleeces and fibers. The balance between the two is crucial, and herders pay attention. When shearing season comes around, the herds are marked for quality. Sheep marked with one blue dot (the paint is a chalky substance which washes out when the fleece is cleaned) are fine -- those marked with two blue dots are the superfine sheep that win competitions. The finest wool at this farm is some of the finest in all of Uruguay. Malabrigo purchases �the wool that this farm produces, so you are, for sure, going to be knitting with wool from these sheep! This entry was posted on 25th July, 2010 . What are these sheep doing? Oh! They're competing to be on SHEEP WEEK! After going on a really enlightening trip to one of our biggest suppliers of merino in Paysandu, we thought it would be really fun to give you guys a knitter's version of 'Shark Week'! This week will be Sheep Week on the blog, culminating in a giveaway at the end! Updates every day -- stay tuned to learn everything you can about the Malabrigo Sheep and the process of selection for your favorite wool! 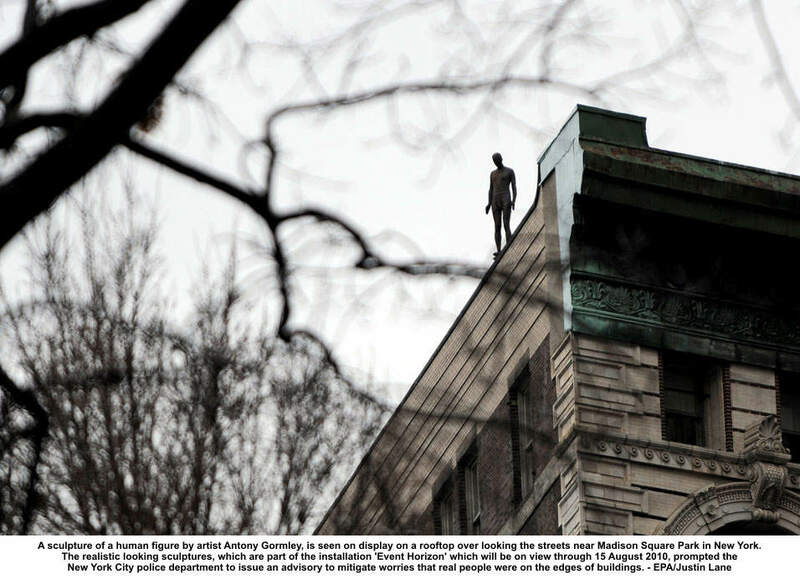 It was amazing and funny because I read that New York City police have responded to many calls in the past few weeks from residents concerned that these life-size body casts gazing down from buildings are real people preparing to jump. � � The crew from Ravelry - Jess, Casey, Mary-Heather and Sarah - have been busy updating their blog with the awesome experiences they're having at TNNA (click the logo above to see the blog). 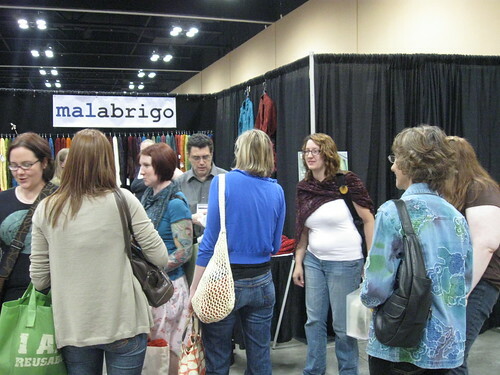 One experience was learning about our new yarn, Rios, at the Malabrigo booth with Antonio! You can watch it here: Hello from TNNA! Rios video -- You have to knit it! This entry was posted on 8th June, 2010 . Malabrigo will be attending The National Needlearts Association's trade show this June -- if you're going, be sure to stop by and see us! We'll be introducing our newest yarn, Rios, to the world, and you know we've always got extra surprises up our sleeves, too. Look for Antonio and Tobias at Booth #222,224,226 June 12 - 14, and Melissa Leapman will be signing Malabrigo Book 2 as well, on Sunday at noon. Meanwhile, we will be holding down the fort here at the factory, so keep an eye on the blog for news and other extra-special posts. This entry was posted on 22nd September, 2009 . 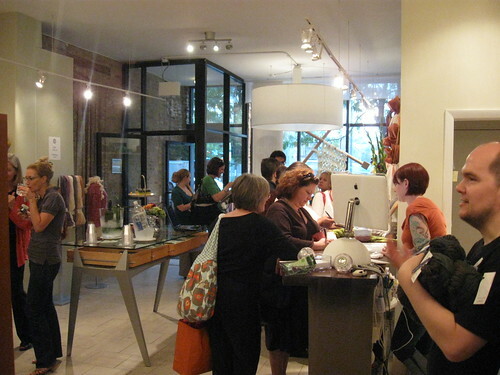 Right before the Stitches Midwest show, Nina, a well knit shop, in Chicago, held a reception for Malabrigo. Lots of people and of course, lots of yarn! At the show we had a wonderful meeting with a lot of Junkies, we met at the booth and then some of us had lunch together. It was a pleasure to meet you all! This entry was posted on 18th June, 2009 . 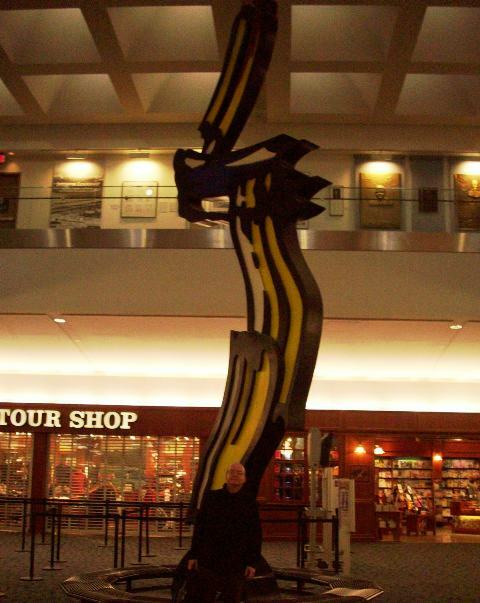 This entry was posted on 12th June, 2009 .
we arrived (finally) at Columbus for the TNNA show. We had a much longer than expected flight, because there was a thunderstorm in Dallas and the plane had to land in San Antonio, TX to refuel before attempting to land in Dallas. Of course the airport was a mess, but we were very lucky as our connecting flight to Columbus was also delayed so we did not have to book a new flight, the plane was kind of waiting to us! It seems that this is going to be a very exciting show, lots of new things, we are introducing the Malabrigo Twist, a new bulky yarn, with several plies in 30 colors. This Friday night is the Fashion show, where we will be displaying a garment designed by Knitter's Magazine, and tomorrow the hard work begins! This entry was posted on 12th May, 2009 . 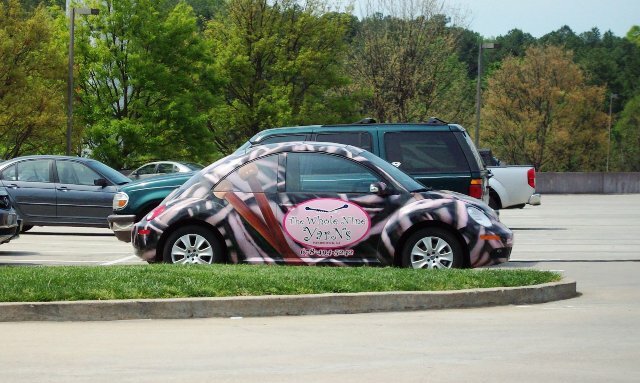 When we went on Thursday to start the show, we saw this fantastic car parked at the front of the convention center parking lot. The Whole Nine Yarns is one of our customers in GA and she surely knows how to make an entrance! This entry was posted on 7th May, 2009 . 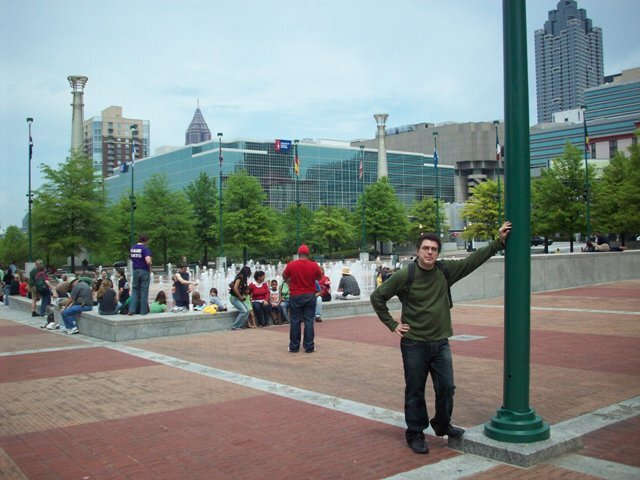 The next day we went visiting Atlanta, we stopped by Strings and Strands, a beautiful shop in our way to downtown. We met Barbara, the owner and we took a picture of the store: Driving around we saw an Alexander Calder sculpture, and of course I had to take a picture for my "collection": After that we went to the Centennial Park and saw a group of high school kids playing with the Olympic fountain: we did a quick tour, it was very nice, and we look forward to coming back next year. This entry was posted on 23rd April, 2009 . This entry was posted on 27th March, 2009 . Antonio and Carla came back from Stitches West in Santa Clara, CA. They had a great time and shared many good moments with the Junkies that went visiting. Here are some pictures and if you are going to Stitches South please stop by! This entry was posted on 6th May, 2008 . O.k., I'm sure Gershwin didn't think about a South American when he wrote that piece, but it works for us also. After Handarbeit we went to Paris to do some field trip research, we did not have many expectations after what we learned in Cologne, but it did not hurt that the research was going to be in Paris. What a wonderful city! We stayed at Antonio's cousin apartment, in St. Germain, a few blocks from the Ile de la Cite and well, within walking distance of mostly every major tourist attraction downtown in Paris. It was amazing just to walk around the neighborhoods. I walked basically most of the city center, working as we walked from yarn shop to yarn shop. We visited several yarn shops, but only one was similar to the yarn shops we are used to, and not even that, they did have many yarns, but it was an over the counter yarn shop mostly. They are yarn sections in the big galleries, and some brands even have yarn shops (quite a few shops actually) around the country that sell their yarn exclusively. So there are Phildar yarn shops and Bouton DOr Yarn yarn shops selling only those yarns. The first one we visited was Le Bon Marche, a VERY upscale department store close to where we were staying. It is an amazing place, several stories tall, but made in the 19th century. The yarn section is in the last floor of the store, and it was surprising. It is one of the two stores we saw that has yarn from several suppliers, it is actually very well stocked, but what was surprising was the store set up. This is not an over the counter yarn store but they didn't display the yarn in any flashy way, each brand had its “wall” and there was nothing out of site or eye catching, everything was very discreet, and even though it was full of people, it was amazingly silent. Next day we went to visit Le Comptoir, a very small yarn shop or Mercerie. It has many different brands for an European store, we saw some other South American brands but of course, I can't say names here! It is an over the counter shop packed with yarns both in balls and cones, very nicely set, in a very warmth way. This is me at the front. After this one I went to visit La Droguerie, right besides Les Halles and St. Stephen church, all the yarn they had was made by or for them, they had a lot of different types of yarn though. It was a wonderful neighborhood to visit, but then, one of the most remarkable things about the trip is that all the shops we went were worth the visit, either for the shop or for the location. My last visit was to Galleries Lafayette, where they have a big yarn section that has Phildar exclusively. It's pretty big though. Ah, and we got to see the Olympic Flame running besides the Sein, of course, I did not do anything to extinguish it, those French cops looked pretty mean, but there were some guys besides me shouting like crazy against it. Well, as expected, Paris was great,fantastic, just to walk around from store to store was amazing, it's such a wonderful place to walk and visit that I think we will have to make another field trip there very soon! This entry was posted on 25th April, 2008 . A few weeks ago we (Antonio and I) went to Handarbeit, a trade show in Cologne, Germany, similar to the TNNA trade shows in the US. The first thing we encountered when we got in was a knitted car cover! Not really pretty but funny! The booths were big (some were huge by TNNA standards) and most of them displayed the yarn mainly (and some only) with garments. 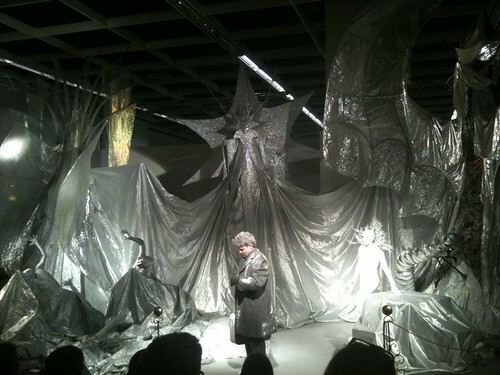 They really showed that Handarbeit was more a fashion show than a trade show. 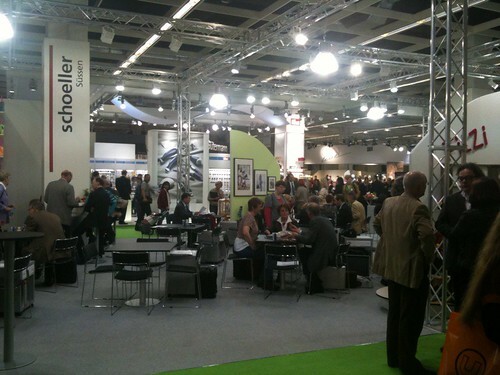 This is Coats, one of Europe's main yarn distributor, a huge booth, This is another view of the same booth and one of the show's several rest area, very fashionable! The part to the left of the booth is a huge "private room" were they received customers and took orders. Many booths had refreshment bars, were they served food and beverages. Some had fashion shows and a stage inside the booths. The main fashion show had 9 models on stage that performed an act for each company. This show was repeated each 2 hours. A Fashion show inside a booth The main fashion show on stage. There were several performances like this, each for a different company displaying the company yarns. This is the Lana Grossa act: For what we saw at the show, handpainted yarns are not very popular in Europe right now, it is very difficult for a small company to enter the market, because most if the distribution is handled by big companies. So many of the small companies yarn sold in the US and Canada are very hard to find in Europe. We also went to visit two yarn shops in the city, Maschenkunst and one right beside the opera house. Maschenkunst (owned by Daniela Johannsenova) carries Malabrigo and it was the only store similar to the North American yarn shops we saw in our European trip. They sit there and knit and talk (in German so we did not understand a thing!) but we felt like home the moment we went in. She told us there was another shop close to the Cathedral so there we went and it was our first experience with a truly European shop. They had no place to sit, most things were over the counter, and the yarns they had were mainly European or distributed by big companies. The woman was very friendly but she did not speak English, (nor French nor Spanish by the way) so we visited the store and off we went. We were told that most European stores (at least the continental ones) are like this, and for our experience in Paris it seems that it's true. � Tobias.